Unless you switch to a purely organic diet, much of the food you eat probably is packaged in aluminum cans. Aluminum, the most abundant mineral in the world, provides manufacturers with an ideal packing material since it keeps food edible for long periods. Although aluminum cans are recyclable, they still carry environmental disadvantages, and may pose a health risk to the public. Bisphenol A, commonly referred to as “BPA,” is a toxic compound found within some plastics. Aluminum can manufactures line the interior of the cans with a thin coating of plastic to prevent aluminum from leeching into the food. Unfortunately, one side effect of including a plastic lining in aluminum cans is that consumers can be exposed to toxic levels of BPA. According to the Environmental Working Group, BPA exposure in lab animals caused cancer, infertility, miscarriages, polycystic ovarian disease and insulin resistance--ailments the organization hypothesizes also could occur in people. After a person opens an aluminum can, the interior poses an injury because of its sharp edges--a risk not found in other types of food packaging material. The "British Medical Journal" notes that injuries sustained from opening aluminum cans may cause the need for stitches, sterile dressing and antibiotics. This risk affects children, as well as adults. 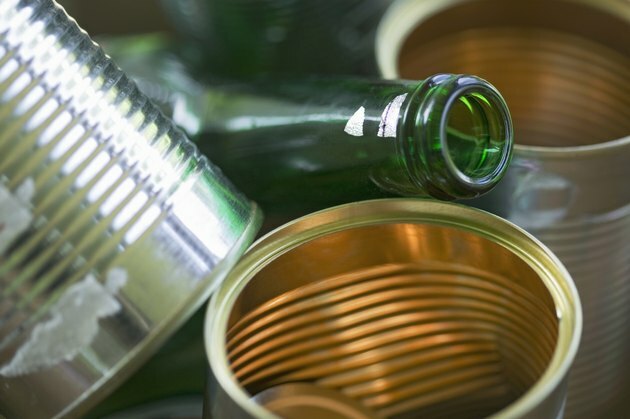 Although aluminum cans are recyclable, the Container Recycling Institute notes that approximately half of all aluminum cans end up in incinerators or landfills--resulting in the need for additional cans made from new materials. Aluminum smelting gives off sulfur dioxide and nitrogen dioxide, which can result in both smog and acid rain. Aluminum can manufacturers must strip-mine bauxite ore to obtain enough alumina to manufacture the cans. Creating 1 ton of aluminum cans leaves behind 5 tons of liquid waste material that can pollute soil and groundwater. One-third of all aluminum manufacturing plants use coal when they produce aluminum cans. Another 10 percent rely on other fossil fuels, such as oil and natural gas. Fossil fuels, although a common energy source in the manufacturing industry, are limited. Coal, oil and natural gas form from decaying organic matter beneath the earth’s surface over millions of years. Once the earth exhausts its supply of fossil fuels, creating more isn’t an option. Aluminum cans may preserve food for long periods, but without a can opener, opening some aluminum cans presents a challenge. While opening an aluminum can with a knife is possible, you risk injury when doing so. Other food packaging materials, such as cardboard and plastic, open easily--preventing you from having to make an impromptu trip to the store should your can opener break while preparing a meal.